Interpreting Earth history is a prime goal of the science of geology. Like a modern-day sleuth, the geologist must interpret clues found preserved in the rocks. By studying rocks, especially sedimentary rocks, and the features they contain, geologists can unravel the complexities of the past. The law simply states that in an underformed sequence of sedimentary rocks, each bed is older than the one above it and younger than the one below. 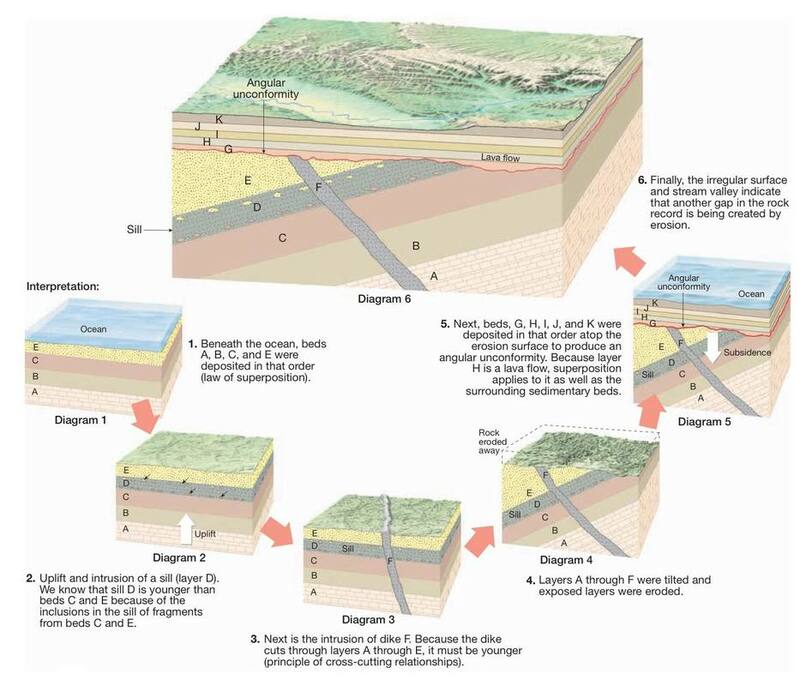 Layers of sediment are generally deposited in a horizontal position. Thus, if we observe rock layers that are flat, it means they have not been disturbed and they still have their original horizontality. However, if they are folded or inclined at a steep angle, they must have been moved into that position by crustal disturbances sometime after their deposition. The fault or intrusion is younger than the rocks affected. The faults and dikes clearly must have occurred after the sedimentary layers were deposited. ​Within a limited area, correlating the rocks of one locality with those of another may be done simply by walking along the outcropping edges. However, this may not be possible when the rocks are mostly concealed by soil and vegetation. Correlation over short distances is often achieved by noting the position of a distinctive rock layer in a sequence of strata. Alternatively, a layer may be identified in another location if it is composed of very distinctive or uncommon minerals. 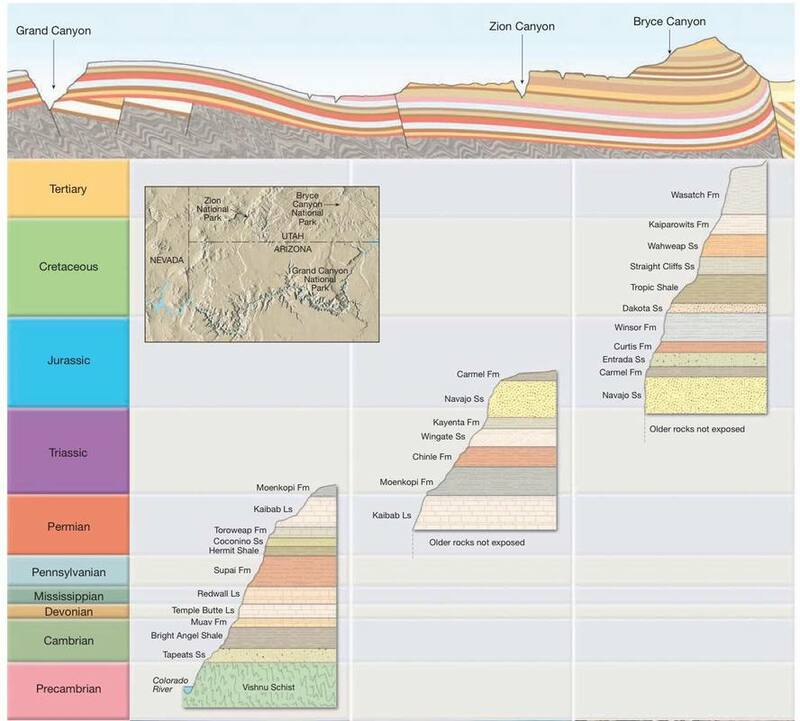 Geologists have divided the whole of geologic history into units of varying magnitude. Together they comprise the geologic time scale of Earth history. 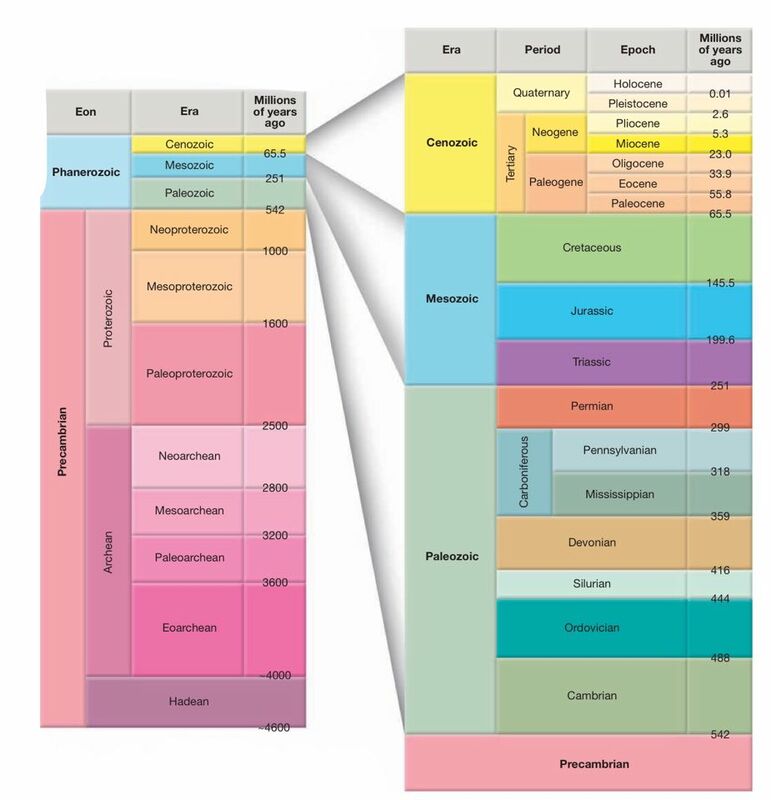 The geologic time scale subdivides the 4.6-billion-year history of Earth into many different units and provides a meaningful time frame within which the events of the geologic past are arranged. The short time the exposed sediments have had to form and to accumulate petroleum. General lack of an impervious cover to create traps conditions. General nonmarine character of the sediments. General metamorphism. Lack of permeability. Most of the pre‐Cambrian occurrences are found in fractures and secondary openings resulting from weathering and deformation. Rocks of Tertiary age continue to dominate in the total productivity, and several reasons may be suggested to account for this: It contains thick sequences of un‐metamorphosed marine sediments characterized by lateral gradation, permeable reservoir rocks, adequate impervious cover, numerous traps and an adequate supply of petroleum. Since it is late in the geologic time scale, only a minor part of it has been removed by erosion. It consists of material eroded from per‐Tertiary anticlines, which include some of the oil that seeped out from the larger oil pools in the eroded rocks.